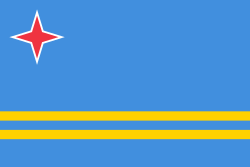 Aruba's national flag ( ) was adopted on March 18, 1976. The design consists of a field of light blue (called "Larkspur"), two narrow parallel horizontal yellow ("Bunting Yellow") stripes in the bottom half, and a four-pointed white-fimbriated red ("Union Flag red") star in the canton. The two narrow stripes "suggest the movement toward status aparte". The other "industry, all the minerals (gold and phosphates in the past, petroleum in the early 20th century)". In addition to sun, gold, and abundance, the yellow is also said to represent wanglo flowers. The red colour also represents bloodshed by Arubans, the Indian inhabitants, during the French pass[clarification needed] war; patriotic love. There is also a standard for use by the Governor of Aruba in his capacity as representative of the Monarch of the Netherlands. It consists of a white field, with the flag of the Netherlands striped across both the top and the bottom, and a circular version of the flag of Aruba in the centre. This page was last edited on 18 April 2019, at 01:33 (UTC).